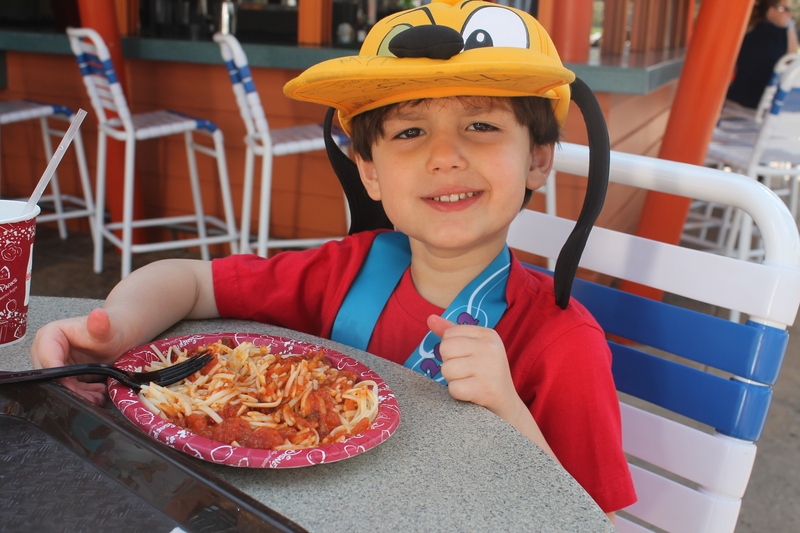 Upon arriving to Disney World, I was 9 weeks into a raw vegan diet. 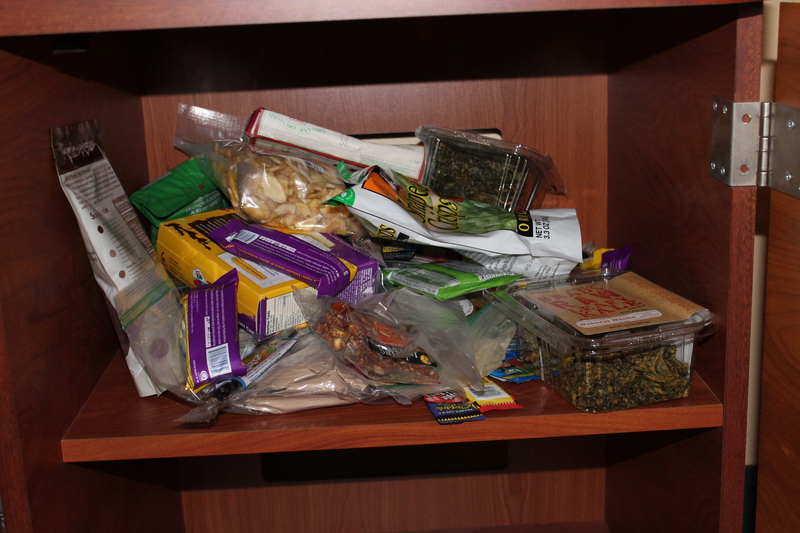 Anticipating the lack in foods that might be available to myself and my vegan family, I traveled a lot of snacks! For the two days up until my race, I wanted to remain on my raw diet and not chance changing my routine. 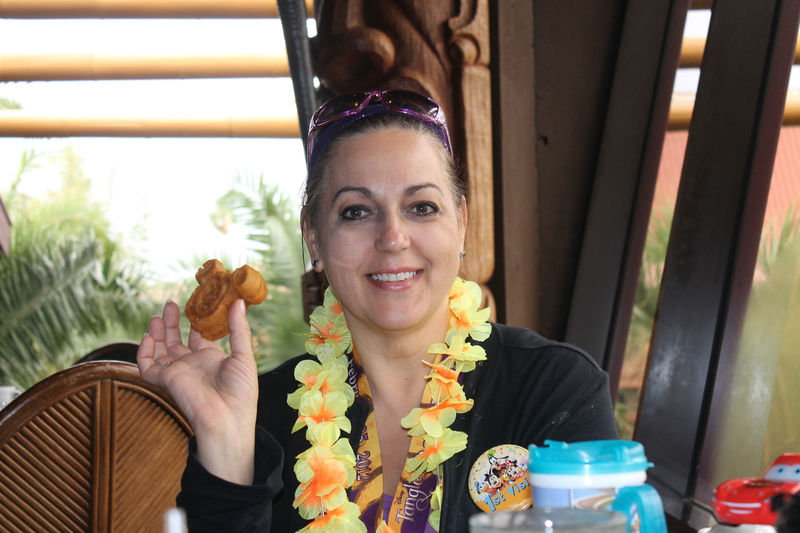 Once the race was over, I couldn’t wait to indulge in all of the wonderful vegan foods that Disney had to offer (and didn’t really have a choice, there are NO raw options!). A word of advice, do your research first and find all of the restaurants that offer the foods you are looking for, then make reservations accordingly. Prior to my trip, I read that I should have the person booking my reservation note that we are vegan, but it didn’t really seem to make a difference, so I wouldn’t worry about that too much. All of the sit down restaurants are buffet style and have vegan options available. Do ask to speak with the chef upon arrival. They will come out and walk you through the buffet and point out which items are vegan. It seems much harder to find vegan options at the quick service locations within the parks, but I believe there is at least one available at most places. 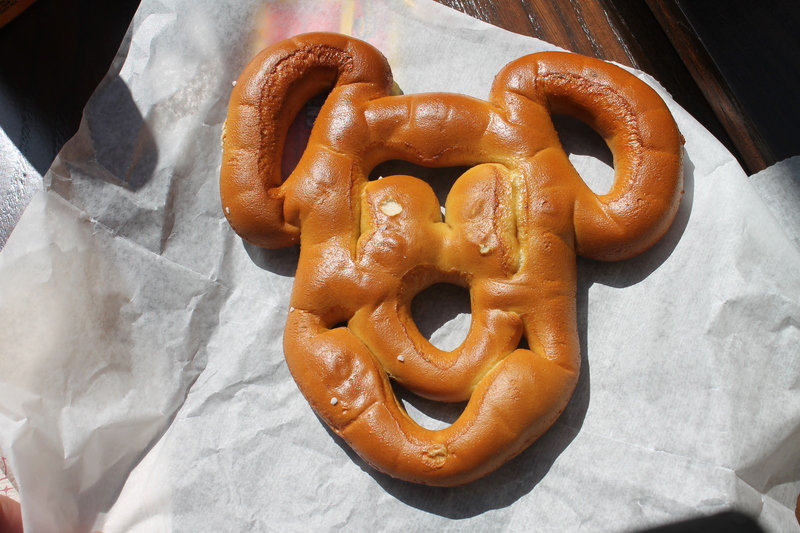 For a quick snack when walking through the park, you can opt for a Mickey pretzel or the butter-flavored oil popcorn available at one of their many, many popcorn carts throughout the parks. The popcorn IS vegan. The oil is butter-flavored without the butter! We went to the Crystal Palace located inside the Magic Kingdom for dinner, which begins at 4 o’clock. Prices were $40 per adult and $20 for my son. The buffett offerings were wonderful, and the chef was very friendly and helpful. Prices are cheaper for lunch and perhaps breakfast as well (I don’t know that for sure), but did inquire about lunch. It seems as though I failed to take photos of the food because I was so wrapped up in taking character photos! 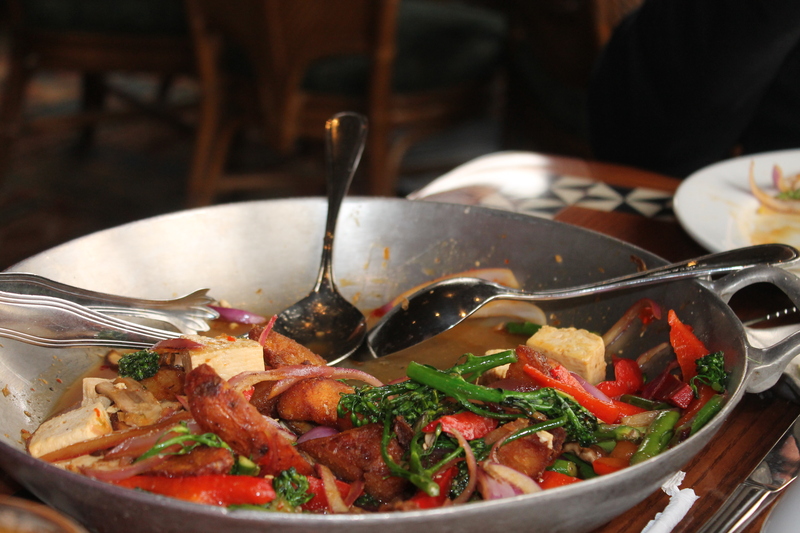 I remember a variety of salads, pastas, and veggie selections available for vegan options. For dessert, they had Tofutti ice cream and a vegan brownie! We loved the ice cream so much, that we went looking for more the next day. Unfortunately, in order to purchase any food from the restaurants, you must sit down to eat, no to-go orders available. To attend a sit d0wn restaurant (as opposed to the quick service eaterys), you need to have a reservation. I had read about a ice cream stand located in the kingdom which offered vegan ice cream. I searched high and low, but could not find the stand or any vegan ice cream anywhere! I learned through a conversation with Robert, the manager at Cosmic Ray‘s, that we should head over to the Main Street Bakery for some vegan ice cream. When I approached him with the question of where we might find some ice cream, he wasn’t sure so he texted a chef friend of his to find out. Within minutes, the chef let him know that the Magic Kingdom ice cream parlor was under construction, but that we should head to the Main Street Bakery (which does not serve ice cream) for our sweet treat. Of course, once we headed over there, they had no idea what we were talking about, but once I told them that the chef had sent us, they served us up some vegan ice cream on the house! We went back the next day to buy some more! 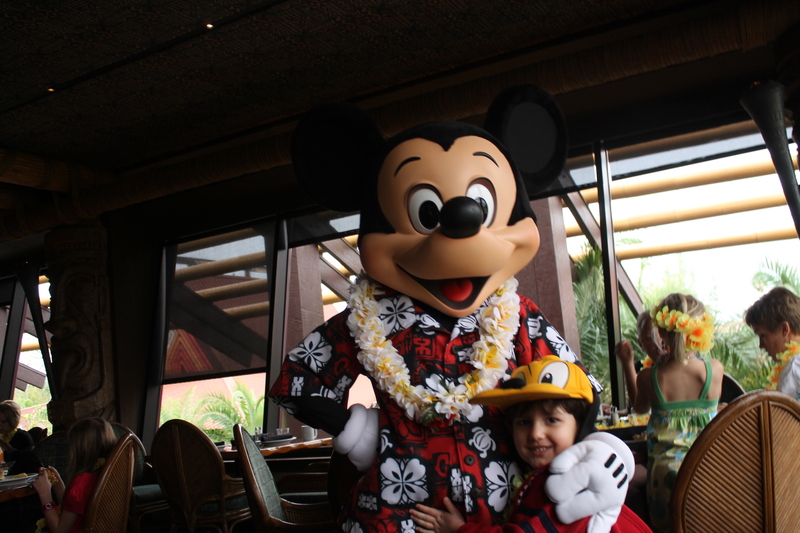 It took awhile for them to get it; apparently it is stored somewhere deep in the freezers since the ice cream parlor is temporarily closed, but it was soooo worth the wait……..
‘Ohana, located inside Disney’s Polynesian resort, is a fun hawaiin themed restaurant that offers character dining. Upon entering the restaurant, each visiter receives their own ley to keep. 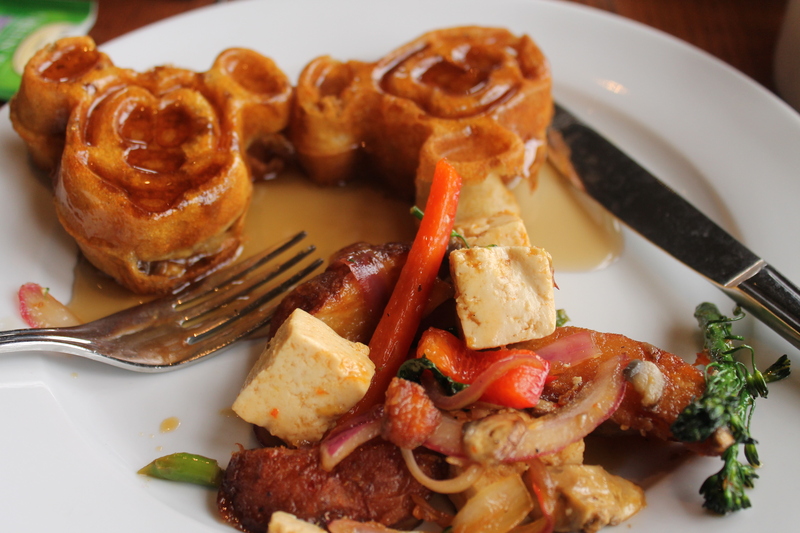 We made reservations for character dining and couldn’t wait for our vegan Mickey waffles! The meal started out with a fruit plate. 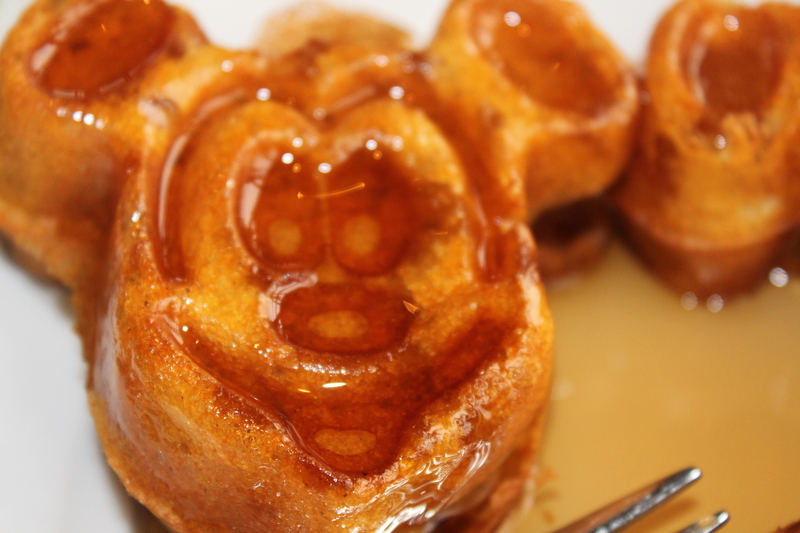 Yay for Mickey waffles! We loved our meal here, highly recommended. In Tomorrowland is a large cafe named Cosmic Ray’s Starlight Cafe. They offer a yummy veggie-burger to make for a great lunch in the Magic Kingdom. Don’t be fooled though, their burgers are topped with a nonvegan bun. Be sure to ask for the nutritional information available prior to placing your order. If you ask to speak with the manager, they will help you out with picking the right bun for your burger. 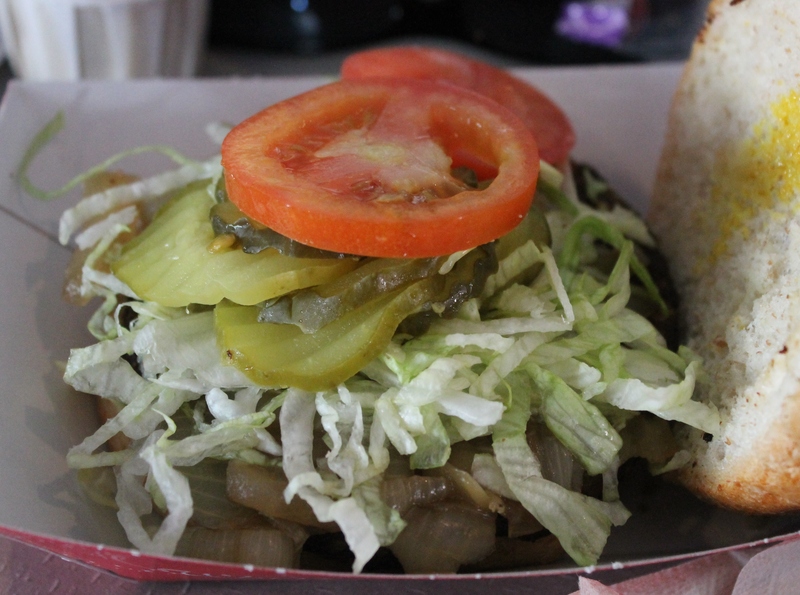 This burger comes plain, but there is a fixings bar available for you to pile on the toppings! 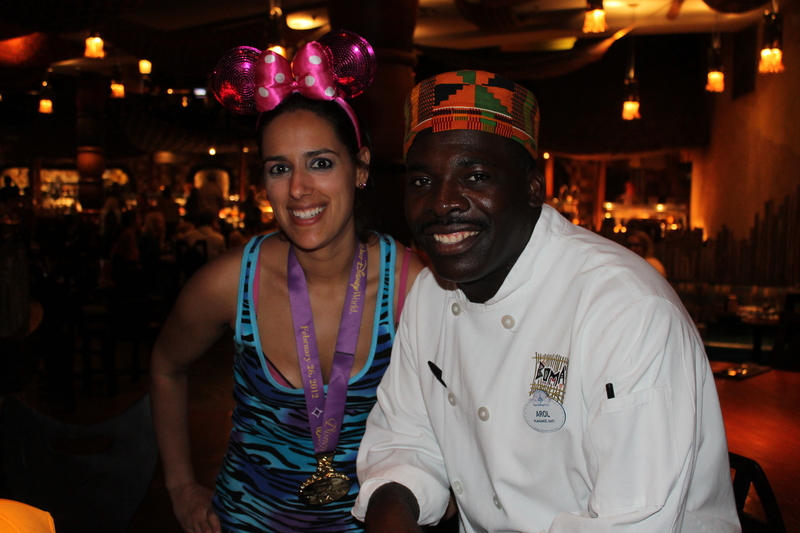 Located inside the Animal Kingdom resort, is Boma, a restaurant dedicated to the fantastic flavors of Africa. I made dinner reservations here thinking it would be a great experience for my son to see all of the animals roaming around the hotel. What I didn’t consider was the fact that it was winter time and the night sky falls upon us at 5 p.m. The animals aren’t out after dark, and if they are, you certainly won’t be able to see them in the black of night. So, note-to-self……make your reservations for daylight hours, unless you are staying at this resort, then it really doesn’t matter, does it? The buffet at Boma had several vegan options available and we could have had our whole meal from the buffet, but chef Arol came our to greet us and made some amazing dishes for us! Falafal dish with couscous, brocolli, and roasted veggies prepared for us by the chef. 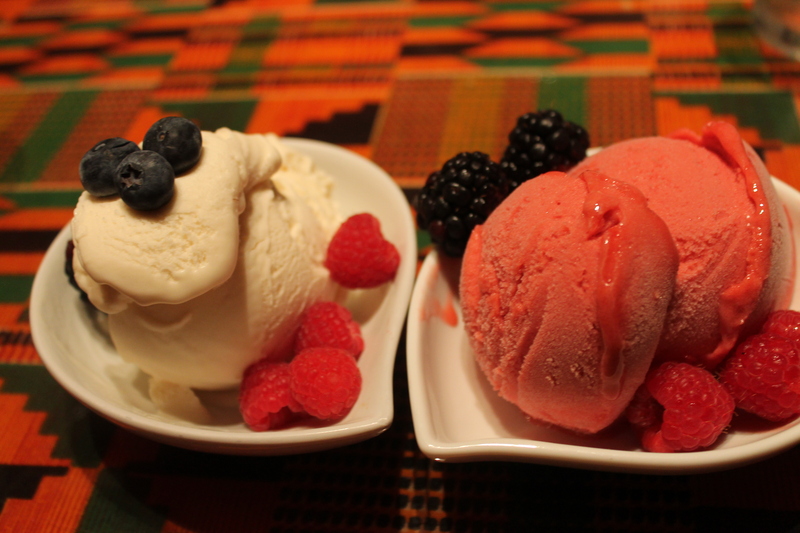 Tofutti Vanilla ice cream and a Raspberry Srobet, YUMMMMMM!!!! The eatery at our hotel, Disney All-Star Movies Resort, didn’t offer very much in the way of vegan food options. For breakfast on the days we didn’t have reservations elsewhere, we purchased their fruit bowls. For about $3.99, maybe $4.99, they had premade fruit bowls available. 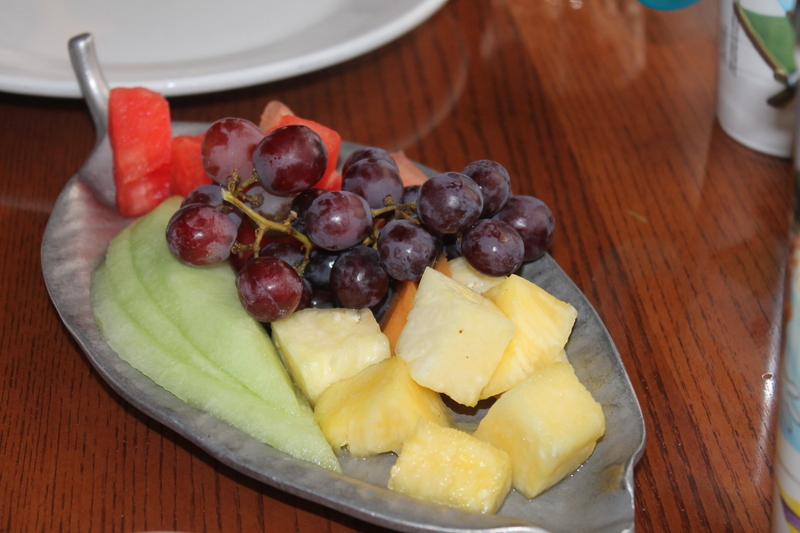 You can choose from an all grape bowl, or a variety which included grapes, catalope, melons, and pineapple. It was our next to the last day there that we discovered they are able to make vegan Mickey waffles! Woohoo! Be sure to ask to speak with the chef, I quickly learned that many of the restaurant employees were not educated on the nutritional needs of a vegan diet. The lunch/dinner options were very limited: salad or spaghetti (make sure they do not add the meatballs or the breasticks). I beleive there was a veggie burger of come sort too, but I never really checked it out. 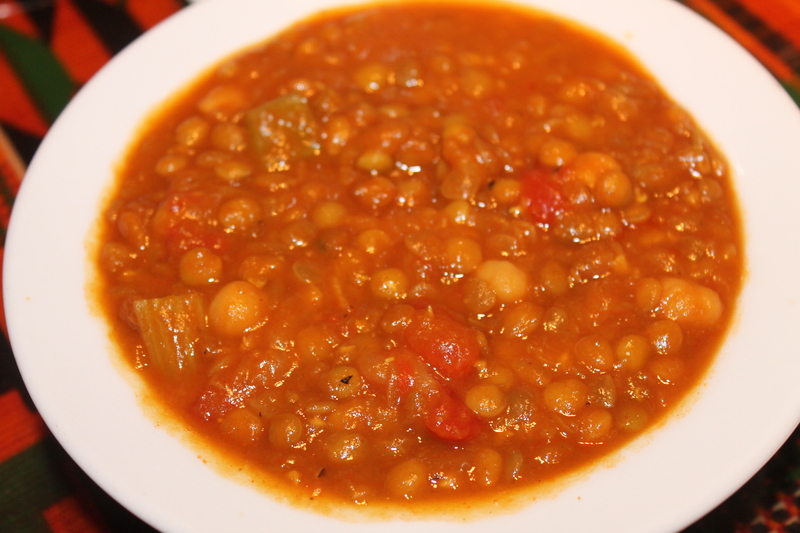 Also, available was a vegetable soup. 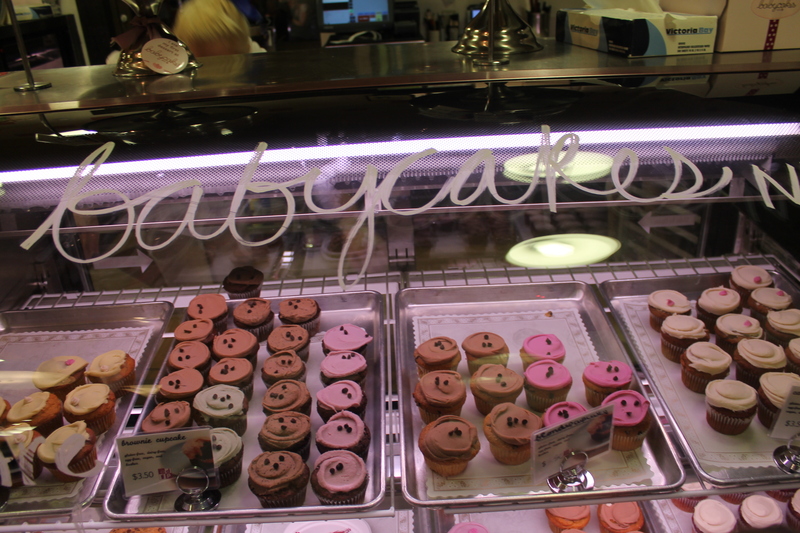 Located in Downtown Disney, is Babycakes bakery. Babycakes is an ALL vegan bakery based out of NYC. If you venture to downtown Disney for some vegan sweets, you’ll want to find the Lego Factory and walk past it (with the water on your right). You’ll then make a left turn into a building with a food court inside. Immediately make a right when you walk through the door, and you’ll see Babycakes. I hate to say it after hearing all the rage about this place, but I’ve had better…..sorry guys. 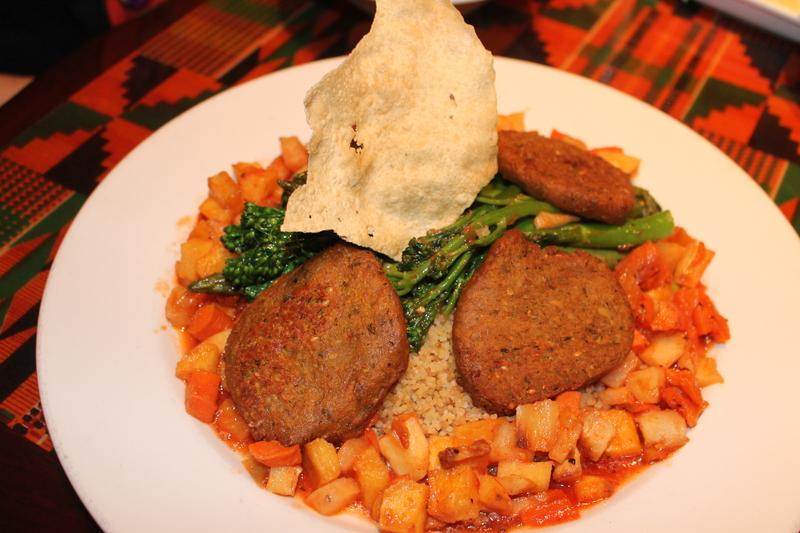 Even so, it is a treat to have a all vegan eatery of any sort located within a Disney Destination! All-in-all, I was happy with the selections available for vegans at Disney and will check out some new places on our next trip. I hope this has helped you to plan your Disney vaycay and feel free to contact me with any questions! If you have had any of your own experiences you would like to share, please do in the comment section!!! Thanks for all the healthy options at Disney World. I am not a vegan, but I am trying to eat a healthier diet (for me and my family). The vegan options sound great, I’ll definitely be going more that route next time I’m at DW. By the way, don’t let the dark stop you from watching the animals at the animal kingdom lodge, there are night goggles available from cast members outside. They are limited in supply, so you might have to wait to use them, but it’s a neat experience. Thanks again for the healthy food tips! Thanks for the tip Laurie, I will check it out on our next trip! I thought they had mentioned the night vision for hotel guests only. It’s wonderful that you ate interested in trying new things for yourself as well as your family. Keep me posted on your ventures and new experiences! Thanks for reading!! just to let you know, the onions and mushrooms served at the toppings bar at cosmic rays is cooked in butter, at least last I was informed. Thank you so much for sharing! I will check it out and report back.